With mobile snatchings on the rise, it is very important that people install a powerful anti-theft app on their smartphone/tablet so that they can wipe sensitive data, lock their device and, in the best case scenario, catch the damned thief. There are a variety of options on Android: We’ve covered apps like avast! 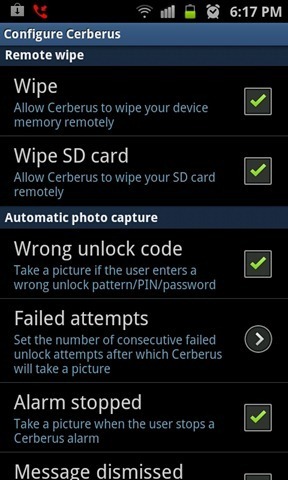 Mobile Security and Lookout Mobile Security that offer anti-theft features for free, and today we’ll be discussing Cerberus, a highly-respected paid anti-theft app that offers an unbelievably strong variety of features that security-conscious will absolutely love. Cerberus recently reached the 100,000 app downloads milestone and are celebrating the occasion by giving away paid licenses for free for limited time. If you want a free paid license, check out our short step-by-step guide after the jump. Step 1: Download, install and launch Cerberus’ free 7-day trial [Market Link]. Step 2: Sign up for an account. Note down your username. 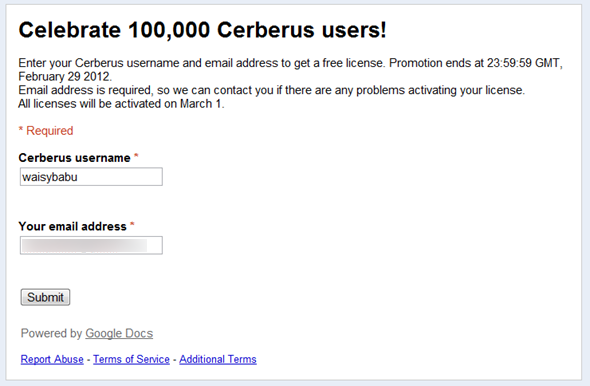 Step 3: Head on over to this Google Docs page, enter your Cerberus username and email address and press Submit. You response will be submitted to Cerberus. This promotion of sorts will last till 23:59:59 GMT on February 29th, 2012, so get it while it’s hot! Users who signed up will have their life-time licenses activated on March 1st. Once set up, you can locate and track your device, initiate a loud alarm, wipe internal memory as well as SD card, lock device, record audio, access call log and a whole lot more via Cerberus’ online dashboard or through text messages. 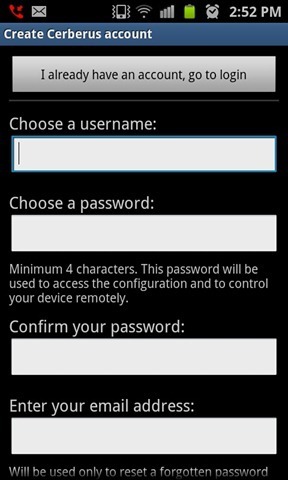 Folks with rooted devices get complete uninstall protection and GPS auto-enabling on ICS. This is, undoubtedly, the anti-theft app for Android! Don’t forget to let us know what you think of Cerberus in the comments section over on our Facebook and Google+ page. A pretty great post. Actually thieves are becoming more terrible for our daily life. I think users should be careful about their cell phones. Besides, they may try iLostFinder. Hope they may get benefit.